It was a dark and stormy night. The girls’ bus pulled over to the side of the expressway as the heavy rain pounded from all sides. Lightning flashed around us as we sang every hymn we knew. Unbeknownst to all, the drums were being drenched in the downpour. As a few mothers held a garbage bag up to the leaking roof of the bus, there came a cry, “We need duct tape!” Illuminated by a flash of lightning, a figure appeared, arm raised, and heroically exclaimed, “I HAVE DUCT TAPE!” It was Sarah Gonyer, tuba player and friend to all. The leaks were efficiently taped, the storm calmed, and we were on our way. We arrived at Cracker Barrel, sleep deprived but excited, and enjoyed our large breakfasts. I believe everyone would agree, however, that the gift shop was the best part. From slide whistles and yo-yo’s to biting wiener dogs and flying pigs, it was extremely entertaining (especially to homeschoolers). Cameras clicked as we got our first glimpse of the Gateway Arch in St.Louis. Only four more hours to our destination: Branson, home of Country Music! Many of the students then went swimming before heading off to see Sight and Sound Theatre’s production of “Jonah,” which was complete with a giant faux whale and live animals. On the third day of our trip, we packed our luggage and were down to the bus by 6:45am. We were driven through Fantastic Caverns, where we were told by our driver that, “Pillars are called columns down here ‘cuz you sleep on yer pillars.” That gave us all something to laugh at! The acoustics were incredible down in the caves, so we sang a verse of Amazing Grace that I will never forget. For lunch, on our way back to St.Louis, we stopped at Lambert’s Cafe, ‘Home of the Throwed Rolls’. The name is quite self explanatory. Catch the famous rolls or you go hungry! Well, maybe not quite. There was plenty of other food to eat there as well. Some selections included fried okra, mashed potatoes, a “light” chef salad ten stories high, chicken and dumplings, and mugs of your beverage about 6” in diameter! Then the big day finally arrived; the parade we had all been waiting for was here! The St. Louis Veiled Prophet Parade! The Veiled Prophet Organization strives to, “enrich the quality of life in the greater St. Louis community.” They also create large floats and participate in the parade. “ The kindness of the other bands,” is what Caleb Ford liked the most about the parade. After the parade, we ate at Grant’s Farm, a farm that General Ulysses S. Grant founded and farmed in the 1850s. After that adventure had ended, the band watched an Imax movie called “Lewis and Clark-Great Journey West,” which was another superb feature of our trip. Some band members were able to view fireworks by the riverside, while others enjoyed dinner. I walked through the damp grass by the Arch, and the moon shone brightly across the lawn. I thought about what a blessing all the people around me are! I am so thankful for everyone who coordinated anything involving the St. Louis Trip: the Marches, Mr.Stiles, my family, all families and teachers, and WMHFA. The list goes on. The trip was an absolute blast, an experience I believe every musician should have! Although the Northern Lights’ Great Journey Southwest has ended, our light continues to shine. fun, excitement, with a some nervousness mixed in. Keep practicing, have a great summer, marchers have fun at Marching Band, and see you next semester! "I think that was even better than last year!" was an overheard comment spoken by a sweet lady at one of the Northern Lights Chorale's recent performances. What a compliment! The Chorale -- an audition-only vocal group composed of 20 students -- has been working hard all year, and has had the opportunity to sing at three different venues since September. Their first performance was at a Naturalization Ceremony (in which foreign immigrants become citizens) held in downtown Grand Rapids. They sang the national anthem, which the presiding judge dubbed a "wonderful rendition", as well as "God Bless America", and the patriotic tune entitled "They Dared to Dream". 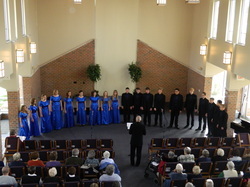 For their second performance, the Chorale made the annual drive to Kentwood Community Church to provide music for a midweek service. Alto AshleyGrace Stephenson stated that this performance was her favorite thus far "because it was familiar, people are so accepting, and they applaud a lot!" Most recently, Northern Lights presented musical entertainment at a local Ladies Christmas Tea. When asked how she felt the Chorale has progressed as a group since the first performance, alto Maggie Mulder shared her opinion. "I think our voices blend better." Another alto, Kaylee Elder, added, "The four sections are more balanced now." A general survey of the group indicated that the favorite performance songs of this year come to a close tie between "In Christ Alone" and "The Twelve Days of Christmas." The survey also revealed that most members of the group are greatly anticipating the upcoming Christmas Concert. AND GUESS WHAT?! No worries, you’re going to play great, you’re going to meet new friends and have a blast this year! Welcome one and all to the 2013 WMHFA fall semester! If you are a returning band, orchestra, or choir student, we are pleased (hopefully) to see your bright familiar faces! Make sure that you help those first year kids that are nervous for the first few weeks. If you felt like the little kid up above, then you know what it might feel like to them! So make sure to give them an encouraging word, a little nudge in the right direction and answer any questions that they may have. And for you wonderful first year students, welcome as well! We know that your first day here might be a little hectic, but never fear! All of the older kids that you see going around the hallways to their classes were more than likely in your shoes too, so don’t be afraid to ask one of them for a step in the right direction, or a helping hand with some of those band supplies! Have a wonderful year WMHFA, and can’t wait to see the talent you guys will shine before God, and the world! WMHFA is an excellent Fine Arts program. It offers classes that enhance learning and equip budding musicians. But WMHFA is more than that. It's a community. Take it from this slightly sentimental and nearly nostalgic senior - WMHFA is more than music. You can't attend here for any given length of time without walking away with new relationships. Whether it be with your favorite instructor or stand partner, your competition or the girl whose flag seems to have a magnetic pull in your general direction, your quartet members or the people who have social hall the same time as you - you're given the opportunity to work with people to create beautiful sounds and images. And, hopefully, you survive that experience and come out as friends! Community is a wonderful, God-glorifying thing ("Let us not give up meeting together, as some are in the habit of doing, but let us encourage one another daily, and all the more as we see the day approaching." Hebrews 10:25) and one of the ways the community of WMHFA thrives is through the student Prayer Group. At approximately 8:36 each Wednesday morning, the basketball bouncing in the gym is subdued by the "Prayer Time!" announcement, and a faithful few will drop their conversations and head down to Room 9 . From 8:40-9:00am , they will have a short devotion, share their praises and requests with one another, and spend focused time lifting individuals and situations up to the Lord. It's a fantastic time of fellowship with friends before the day gets rolling, and a beautiful and encouraging way to live out the command given to us in Philippians 4:6: "Do not be anxious about anything, but in everything, by prayer and petition, with thanksgiving, present your requests to God." So, students, what are you doing at 8:40 Wednesday morning? Could you postpone your card game or leave home ten minutes earlier to make it in time for Prayer Group? Come, grow, intercede, and discover exactly how WMHFA is more than music. You will be blessed. What is WMHFA News? WMHFA News is a new resource of WMHFA media. This resource will include videos and audio of WMHFA performances, "News" style videos of current WMHFA events, and articles written about current WMHFA events and other relevant topics. The cool thing about WMHFA News is that it was created and is run almost exclusively by WMHFA students. The purpose for the WMHFA News is to expand the homeschool music program in an entertaining and enlightening way to increase awareness of things that takes place in and around WMHFA. If you as a student would like to write an article for the WMHFA Empirical, talk to Jack Mennega on Wednesdays; if you would like to be a part of the WMHFA Action News video broadcasts, talk to Josiah March, Hannah Mennega, Clayton Haverdink, or Robby Lamie on Wednesdays. We sincerely hope you will thoroughly enjoy the resources offered by WMHFA News.